Learn to think like a design pro to get the bathroom you've always wanted. 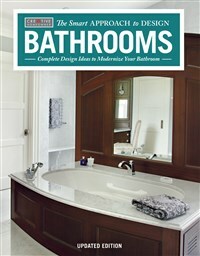 Completely updated with the latest trends, products, and innovative ideas, this new edition offers a smart approach to bathroom design. Consumers recognize Creative Homeowner as their leading and trusted source for the best information, inspiration, and instruction related to the house and home. Creative Homeowner is the preeminent publisher of books on all aspects of decorating and design; home repair and improvement; house plans; gardening and landscaping; and grilling. Creative Homeowner's books stand out from other publications with their complete and easy-to-follow instructions, up-to-date information, and extensive use of color photography. Among its best-selling titles are Ultimate Guide to Home Repair and Improvement, Updated Edition; Ultimate Guide: Plumbing, 4th Updated Edition; and Ultimate Guide: Wiring, 8th Updated Edition. David Schiff is the author of two Stanley Homeowner Guides—Built-ins & Storage and Outdoor Projects. He is the author of several other how-to books and has written articles on home design, building, and general interest for a number of publications. He has worked as editorial director for Creative Homeowner Press and for Reader's Digest Illustrated Reference Books.